In stock Order in the next 6 hours, 18 minutes and it will go out today! This two volume set is a must if you like Jordan's work! Learn the world acclaimed act! - Start Version 1, 2 & 3 for 5 CDs Production. 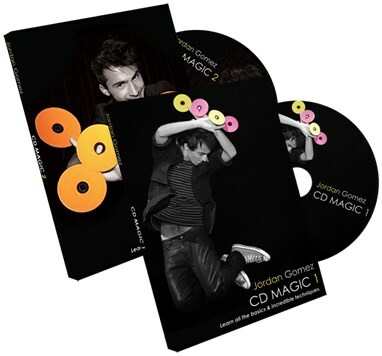 On this DVD, Jordan takes you from the basics of CD manipulation to a couple of very nice, visual routines that are more like segments of a greater act. He covers concealments, productions, droppers, steals, and ditches. He even talks about costume alterations to allow for some pretty incredible magic. This is much appreciated, since very few manipulation DVDs teach more than just sleights. Jordan is a creative and talented manipulator who charms you with his smile and then destroys you with his magic. The disc is in French with English subtitles, but the most important part of the disc is the clear instruction which is captured effectively by the camera. If you’re interested in using CDs in a stage manipu­lation act, this is your starting point.